Abstract : The suicide rate for Aboriginal people can fluctuate between 4 to 12 times the national average. Similarly Lesbian, Gay, Bisexual, Queer and Transgender Individual (LGBQTI) health literature note LGBQTI populations are also a high risk of suicidality. A review encompassing 15 years of Aboriginal and LGBQTI health literature was undertaken; including the current National Aboriginal and Torres Strait Islander Health Plan (NATSIHP) 2013-2015, the Aboriginal and Torres Strait Islander Suicide Prevention Strategy 2013 (ATSISPS) and national LGBTI Health Strategies; Growing Up Queer (2014) and Writing Themselves In I, II, III (1998, 2004, 2010). The review noted a paucity of information on the causation of any potential suicidality at the intersection of Indigeneity, gender variance and diverse sexualities. This study captured voices of Aboriginal LGBQTI peoples through workshops called “Yarning Circles” (Bessarab and Ng’andu 2010); online surveys circulated via Aboriginal LGBQTI networks; and “tweet yarns” (Parker 2014). The online surveys and Yarning Circles established that overwhelmingly participants had not seen any health, wellbeing and suicide prevention strategies or activities for the Aboriginal LGBQTI community, and that this group would like to see some preventative measures in place. These findings suggest the current Aboriginal Suicide Prevention Strategy and national LGBQTI Suicide Prevention Strategy need amending to reflect the unique needs and solutions for Aboriginal LGBQTI communities. 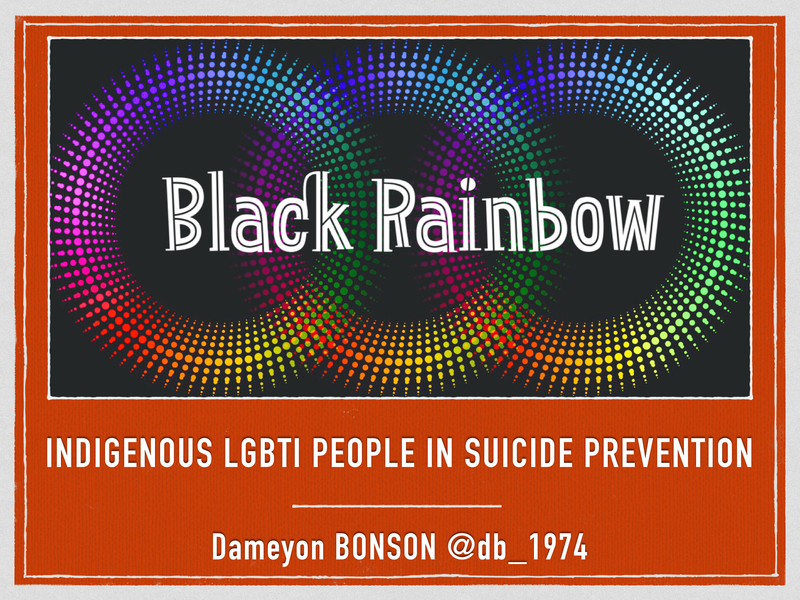 Categories: Dameyon Bonson, Indigenous, Indigenous LGBQTI - Black Rainbow, Indigenous Suicide Prevention, LGBTI, Mental Health, Suicide | Permalink.